Earlier this week I read Vee's post about gathering ferns. No ferns grow in our yard, but while visiting the hospital, I noticed some along the embankment above the parking lot. Tim waited patiently while I scrambled up and picked a few ferns. They looked lovely on the mantel. Today I noticed all the blooms on this nameless and un-pedigreed rosebush. Out I went with my clippers. I do love cut flowers. The vase is one Tim bought me for our 2nd wedding anniversary. We were directing a summer camp near Revelstoke, and were able to take one night away from the camp. We we slept and slept. If you've ever worked at a summer camp, you'll know just how exhausted we were. We did go out for dinner and wandered through town - Tim bought me the vase and I bought him a pair of binoculars. We don't always exchange anniversary gifts, but we did that year. That got a little off track, but don't you think the ferns and roses make a wonderful combination? I'm hoping for endless roses and bouquets from my garden this summer. Linking with Mary for Mosaic Monday. Mary is just back from London and has some beautiful photos. Very pretty bouquet of roses. The ferns do look beautiful with the roses. Lovely vase too! Have a happy week ahead! I think Vee has us all thinking about ferns and the addition of a few fronds with your roses looks really nice. A sweet story - and lovely roses. Thanks for sharing. They do look beautiful together. I love the color on those roses. Your story about the vase is cute. I love things that serve as reminders of sweet memories. 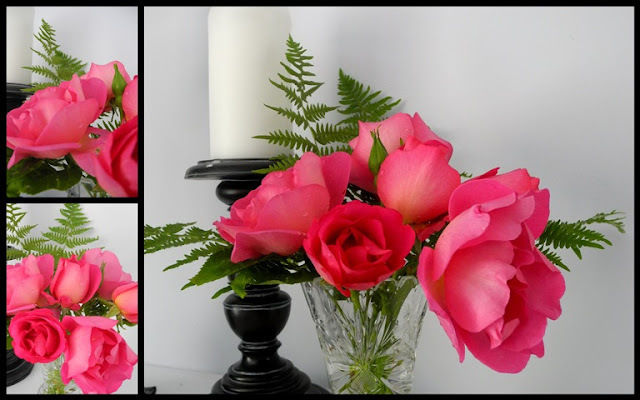 It's a perfect combination - the ferns, roses, AND vase! Beautiful! Beautiful...the ferns, the roses, the vase and the memories! Those ferns are such a wonderful "Spring green" colour and perfect with your very pretty coral rose. Your vase is lovely - we don't do anniversary gifts either - just birthday and Christmas! Beautiful display on your mantel. Yes! Ferns and roses go together and make the perfect bouquet. I have a fern at home that is now more than ten years old! Got it as tiny cutting from a nursery. Love it! What a pretty sight this morning! Yes the ferns add a lot. And off the track stories are wonderful! What a beautiful shade of pink in those roses. They make a lovely bouquet along with the green of the fern fronds. And what a thoughtful gift from your husband early in your marriage! It wasn't an appliance!! :-) I'm sure you will have many beautiful bouquets from your gardens this summer. I love cut flowers as well...picked some lilacs from our yard yesterday...enjoying a small bouquet of white ones ! I want to plant some roses in this yard, I have never frown a rose bush...amply suggestions for a hardy bloomer for southern Alberta? Revelstoke is a beautiful spot and yes, camps can be exhausting! Yes, a perfectly lovely combination. I must check to see how long the ferns lasted...I think five days. I do agree that the roses-and-ferns combination is lovely...and the roses-and-ferns-and-very-special-vase is even lovelier! You have roses!....still waiting up here. I love the look of the roses, the ferns and the crystal. It's just so....Victoria. Not much cutting available yet but I’m looking forward to doing what you did. I hope I can make my bouquets as beautiful as yours.